Amidst the wreckage of a city street, Superman lifts a car above his head and demands to know why Barrage is back in Metropolis.�The battered supervillain struggles to answer, but not quickly enough for Superman.�He slams the pristine automobile down into the pavement, and into the shocked Barrage.�Reaching into the wreckage, Superman rips Barrage out of the remains of the sports car.�He succinctly informs Barrage that all of Metropolis is under his protection.�Then, to give Barrage an idea of what this entails, Superman hurls the villain hundreds of feet into the air and across the city.�A concerned woman yells that he will die, but Superman merely dismisses the idea.�Barrage does wear armor after all.�The owner of the car then approaches Superman about the damage done to his car, but Superman dismisses his complaints.�He'll just burn his autograph into the wreckage and he'll be able to sell it on eBay. Across town, a bank alarm splits the silence as three armed men dash out of the bank.�The security guard in pursuit fires one, before a bullet hits him in the chest and sends him flying backwards through a window.�Another shot strikes a nearby woman and child, both caught standing in the wrong place at the wrong time. �They both fall to the sidewalk.�One of the crooks celebrates his aim, when he is suddenly jerked into the sky.�Superman asks him if he has ever heard of instant karma, and then hurtles him across the street and into a store front.�The other two men unload a clip at the Man of Steel, and then frantically jump into their car.�Superman touches down in front of the car, and after reminding the two men about seatbelts, picks up the car and sends it sailing a few hundred feet before it crashes into a new apartment complex. Inside the Planet, Lois talks on the phone with someone when Jimmy suddenly runs.�He tells her that Superman is on a rampage, trashing bad guys and private property, and making jokes while doing it. In the hospital, Superman listens as the doctor gives his prognosis.�The guard was probably died immediately, and the mother and boy probably won't survive.�There is nothing the doctor can do for them.�Superman says there is never anything anyone can do.�Enraged, Superman speeds out of the hospital a red and blue blur. Inside a hospital, Lois hurries to catch up to a nurse.�Lois asks if Superman visited her this morning.�The nurse is at first hesitant to talk to Lois, but then she caves in. Across town, a tattooed metahuman named Trainwreck hurls an unfortunate soul out of a third story window and into the payment.�Stepping forward into the breach in the glass and holds a gun up to a girl's head.�He yells that he wants a helicopter or he will continue to kill. He is suddenly silenced as he sees Superman speeding toward him.�The Last Son Of Krypton slams into the villain, forcing him back into the building and setting of a huge explosion.�The entire building is engulfed in flames as police and firefighters run for cover.�As the flames die down, Superman compliments Trainwreck on his power.�But before he can do anything else Superman darts forward and grabs him by the head, and proceeds to slam the villain through a series of walls before emerging outside and slamming him into the side of a car.�Trainwreck yells that he surrenders, but Superman just says that people like him never do. Lois follows the nurse into a children's cancer ward as the woman tells her that Superman comes to visit at least once a month to help cheer up the kids.�Lois asks to see the homeless girl named Jamie, the one that was his biggest fan.�The nurse looks toward the ground and says that Jamie is no longer with them. Across town, Superman continues to decimate Trainwreck.�He demands to know how, with all of the deaths in the world, a monster like him continues to live.�Lifting the bloodied villain off of the ground, he demands to know where the justice is in a world like that.�With his eyes blazing, Superman leans towards him when Lois suddenly calls out to him. She tells him that she knows about Jamie.�Lois says that it doesn't make much sense, but Superman cuts her off.�It makes no sense that evil people continue to live while a young girl would die.�He is silent for a moment, before telling Lois that the police had found Jamie in a cardboard box under an overpass.�An abandoned girl with a terminal illness could find joy in life, and yet someone like Trainwreck lives.�He drops the unconscious villain to the ground and asks why. That night, Lois and Clark embrace in their apartment, but he can only ask why. Story - 1: I don't even know how to describe what was wrong with this issue, so I will try to start from the beginning.�Superman has been in action for more than ten years, DC time.�He has seen evil of all forms.�He has seen an entire world decimated by three Kryptonians, Solar Systems conquered by a intergalactic megalomaniac, and fought in a war against the destroyer of the universe.�Superman has lost friends, from regular people to other superheroes like Flash and Green Lantern.�He has children die before, not from a disease that he could fight but from the evil of others.�Adam Grant was killed when he was only eleven by the Toyman for no reason other than he tried to escape.�Adam died saving others, and Superman saw that happen.�During Imperiex's attack Superman saw most of Kansas destroyed.�His father-in-law was killed.�Superman has seen his first love beaten to within an inch of her life by Lex Luthor simply because he could.�His entire city was destroyed by the stubbornness of a sick man.�Superman has killed and Superman has died. What, you may ask, is the point in this poorly-organized and very brief summary of Superman's experiences over the past fifteen years?�Superman has seen pretty much everything.�EVERYTHING.�I am not saying that he has become dehumanized, anything but.�Every experience he has just makes him want to work that much harder to make the world a better place.�But Superman does not act this way. AFTER YEARS OF BEING THE GREATEST HERO ON EARTH, SUPERMAN DOES NOT THROW OUT EVERY ONE OF HIS MORALS AND BELIEFS AND GO ON A MURDEROUS RAMPAGE! I realize that Jamie died, and I realized that this made him upset, but this is not Superman.�He is more responsible than this.�Superman knows his duty to the people of Earth.�To quote a fantastic issue of Superman (Superman 59), he is Superman because no one else can be. For Superman to fly out of control like this is so out of character it is ridiculous.�From the first page on, this entire issue felt wrong to me.�I watched him destroy a perfect car and I wondered why he is destroying public property.�From there it only got worse.�This is entire issue was wrong.�I understand the sentiment.�Yes, the world is not always a happy place.�It is extremely sad that someone so young and innocent would die while others would go on living.�But this grief is not something that sends Superman off the deep-end on a murderous rampage.�He could have killed Barrage.�He could have killed all three of those robbers.�For all we know, he did.�As far as we readers are concerned, Superman killed five people in this issue.�So much for Superman not taking a life since the Phantom Zone criminals.�I guess that it doesn't matter as long as he has a reason to be upset.�I'm sure we will never see any repercussions from this issue.�Despite the fact that he destroyed a good portion of Metropolis and killed five people without any trial, I'm sure that everyone will just go back to their normal lives and never ever think twice of what happened this day. This is the kind of thing that Superman talks to Lois about in their apartment, away from the world.�This is where he works out his inner demons.�He does not alleviate his pain by destroying the city. After reading this issue, I could think of nothing else than how horrible it was.�Superman asked why the world isn't fair; I ask how this issue ever made it past the editor. Art - 4: On a different note, I did like the art.�It was nice and simple.�This art reminds me of the (at least in my opinion) good old days of Jurgens and Grummett.�Superman looked good.�Everyone, in fact, looked good.�However, there isn't much I can say about the art when I was stuck with this story. 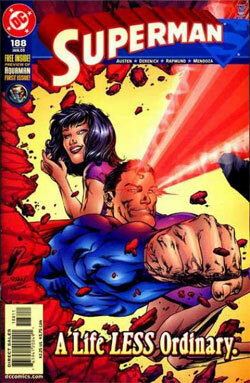 Cover Art - 1: And I don't really care for the cover either.�Lois looks dumb.�Superman has an idiotic look on his face and his chin is way too big.�That isn't even considering the fact that this cover is the absolute polar opposite of what occurs in this issue.�Why is Lois flying around with Superman, they barely even spend any time together at all.�The worst though, is the fact that Superman is smiling on the cover.�SMILING!�Superman is depressed in this issue.�He is depressed and vengeful and angry.�Basically, he is anything and everything but happy.�The cover is definitely better than the story, but that is only because this story was so incredibly awful. We can only hope that nothing like this is ever produced again.�I, for one, want my two dollars back.